WINGS AND WASP: TEX MEACHEM FLIES AGAIN! Tex Meachem, 92, went up flying again for the first time in decades in Fort Lauderdale Friday, April 23, 2010. A former Women Airforce Service Pilot from World War II, Tex (her given name) went up in an AT6 trainer aircraft like she flew in the 1940's. History Flight provided the plane and will be giving flights this weekend at Fort Lauderdale Executive Airport. Two months into her 93rd year, Tex Amanda Brown Meachem ditched her four-wheeled walker, settled into the cockpit of a restored World War II training plane and flew into her past. ``I hope we do some aerobatics,'' she confided. Meachem, a wartime pilot who lives at John Knox Village in Pompano Beach, wasn't disappointed. During a 30-minute joy ride with History Flight pilot John Makinson on Friday, she said she did ``two rolls -- one right and one left -- and a chandelle,'' a climbing/banking/direction-reversing maneuver. As a member of the Women Airforce Service Pilots -- WASP -- Meachem flew dozens of AT-6 Texans, camo-striped two-seaters with a red nose and tail. Friday's adventure fulfilled a wish that she expressed after the 300 surviving WASP veterans received a Congressional Gold Medal in March. She wanted to skipper once more her ``favorite plane'' -- the AT-6 Texan. Marathon-based History Flight, a nonprofit foundation, happens to own one, and brought it to Fort Lauderdale Executive Airport so Meachem could fulfill her wish. As she was boosted into the cockpit, the John Knox Village's 48-voice men's choir gave Meachem a rousing send-off. Climbing high, into the sun. Which it was, especially for Meachem, who founded John Knox Village's chapter of the Red Hat Society: a nationwide social network for women 50 and older who vow to live with gusto. With her ``spirit and determination . . . Tex is a guiding light,'' said Red Hatter Martha Johnson. 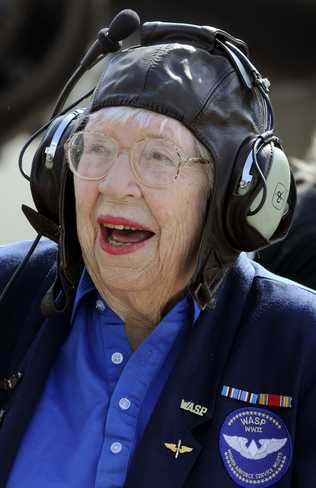 When she learned to fly with the Civil Air Patrol after graduating from the old Florida State College for Women -- now Florida State University -- in 1938, the Tallahassee-born Meachem had nothing in mind but fun. ``Our idea was to fly to Daytona, which was the beach, instead of taking the bus,'' she said. Although she held an economics degree, Meachem was working as a secretary at her alma mater when she heard the Sarasota Civil Air Patrol needed a bookkeeper. She took the job on condition that she could fly. In 1942, the WASP was created. Meachem recalls thinking: ``Oh my Lord -- that's for me!'' She joined immediately. She met her future husband, navigation instructor John Meachem, at an air base in Hondo, Texas, where she was flying training missions for navigation students in a stripped-down commercial airliner. During her two-year stint with the WASP, she picked up new planes at aircraft plants and delivered them to military bases, flew old clunkers to the salvage yard, chauffeured military personnel, towed targets for live-fire drills and once made an unscheduled landing in a North Carolina potato field. The WASP disbanded in late 1944. After the war, Tex Brown married John Meachem. They spent 33 years in Syracuse, N.Y., had three daughters and took up square dancing. Tex joined the Junior League, and earned a master's degree in library science in her late 30s, said daughter Lucinda. Although 38 WASPs died in the line of duty, they weren't recognized as veterans until 1977. The 300 surviving WASPs were honored by Congress, on behalf of all the women who served, for their contribution to the war effort while ``the boys'' fought overseas. John Knox choir member Ben McKinney was a Navy fighter pilot during the war, and said he could well have flown planes that Tex Meachem tested. Meachem was also an inspiration to a younger woman watching the festivities on Friday. Chris Ponticelli flies helicopters for the Broward Sheriff's Office, and just happened to be at the airport. At 45, she's less than half Tex Meachem's age. ViDEO included in original post.